Querrey to defend LA title. LOS ANGELES - Santa Monica resident and defending champion Sam Querrey will return to the LA Tennis Open Presented by Farmers Insurance Group in 2010 to defend his title. The 84th annual tournament will be held July 26-August 1 on the campus of UCLA. Querrey, the 2009 Olympus US Open Series champion, will attempt to be the first player to successfully defend his LA title since Andre Agassi won consecutive titles in 2001. "Last summer Sam really elevated his game during the US summer, and winning in LA was a jewel in his Olympus US Open Series crown," LA Tennis Open tournament director Bob Kramer said. "Having local heroes like Sam and the Bryan Brothers along with top international stars like Novak Djokovic and Juan Martin del Potro gives us a great field for 2010." In the summer of 2009, Querrey reached four ATP World Tour finals on home soil, claiming the title in Los Angeles, which propelled him to the top of the Olympus US Open Series standings. Overall, Querrey reached five finals in 2009, and is currently the third highest ranked American player on the ATP World Tour. 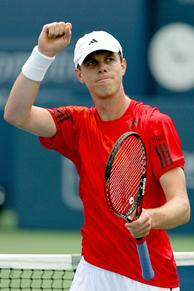 Querrey will join World No. 2 Djokovic and No. 5 del Potro, the 2009 US Open champion, in the singles field at the LA Tennis Open. The No. 1 doubles team of Bob and Mike Bryan will also return to LA, where the will look to extend their 12-match winning streak at the LA Tennis Open Presented by Farmers Insurance Group and are aiming to add to their record of five titles at the tournament. This past weekend, the Bryans won their fourth career Australian Open title. They will celebrate that win Wednesday night when the Bryan Brothers Band Featuring David Baron will play a concert at the Viper Room. Joining the band for the set will be Counting Crows drummer Jim Bogios. The season ticket renewal process is underway now for the LA Tennis Open Presented by Farmers Insurance Group. Additional ticket packages will go on sale in the months before the tournament. Ticket information can be found at www.latennisopen.com.